YALA, Thailand (Reuters) - Pateemoh Poh-itaeda-oh, 39, has lost four family members to violence in Thailand's deep south, where a Muslim separatist movement has fought against rule from Bangkok for 15 years. Sunday's vote is broadly seen as a battle between allies of the military junta leader seeking to stay in power and supporters of ousted ex-premier Thaksin Shinawatra, a former telecommunication tycoon whose loyalists have won every general election since 2001. "For a long time many Thais have looked at problems in the deep south as a marginal border issue, but this election I have seen changes," she told Reuters at her party headquarters in Yala province. "I really want to be a voice in forming policy and solving the conflict issue in the deep south, and people have to remember that women's voices need to matter in this process," she said. For decades, the deep south's small tally of seats - 11 out of 350 being contested in this election - were seen as a reliable bloc for the Democrat Party, the country's oldest political party that is officially non-aligned in the campaign but could prove crucial in post-vote coalition-building. "Generally, people in the deep south are enthusiastic from all sides because they will feel that they can gain justice through democracy," he said. Matha, a former house speaker and the leader of Prachachart Party, is a key ally to Thaksin who could help capture votes for the "democratic front" of anti-junta parties in the deep south. Pro-Thaksin parties have in the past performed badly in the region, where he was widely blamed for exacerbating the conflict with harsh tactics when he was in power from 2001 to 2006. Prachachart has been campaigning greater people's participation in the region's governance and peace process. Even talking about greater autonomy alarms the region's Buddhist minority, and coincides with the emergence on the national stage of the Buddhist nationalist Pandin Dharma Party. "There is a sentiment that Buddhism is under threat and this has been appealing to many Buddhists here," Ruckchart Suwan, 54, of the Buddhist Network for Peace told Reuters. "It is good to hear real grievances from the Buddhists so we can address it properly," said Worawit Baru, 67, a candidate for Prachachart Party in Pattani province. 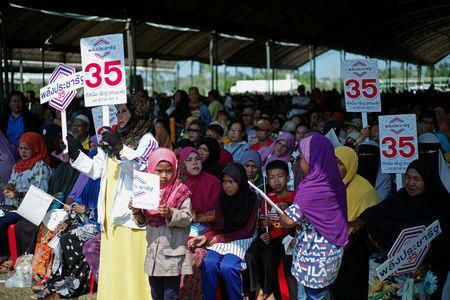 "The security forces have brought Buddhists and Muslims together over meals many times and say this represent successful reconciliation," Worawit said. "These window-dressing approaches must stop and we need the people to speak up."